This is the in-the-round version of the pattern. There is a straight needle version here. Join to knit in the round. Divide stitches between double pointed needles or needles for a magic loop. Divide with multiples of 14 on each needle. 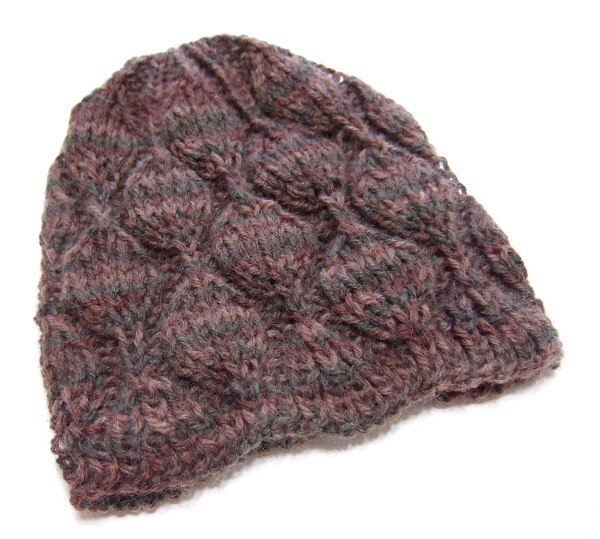 Repeat rounds 10 – 25 until the hat measures 1.75 inches less than desired finished length. Begin crown after a rnd 12 or a rnd 20. I don’t see m1 in the abbreviations. What is it, and how is it done? I realized about an hour after posting the pattern that I had not included m1. It is in the abbreviations now. Hi there,and thank you for your beautiful patterns. I have a question,If I want to knit with straight needle any pattern which is knitted by circular needle,how should I change the pattern exactly? I will always be glad to convert any of my patterns to straight needle patterns by request. 1. Add a stitch to the beginning of each row that isn’t repeated. It should be the same stitch as the stitch at the end of the row (knit or purl). 2. Choose if the even or the odd rows will be the wrong side. Choose the set of rows that do not have increases/decreases or twisted stitches. 3. Reverse the order of the stitches on all the wrong side rows. 4. Reverse the stitches on all the wrong side rows (replaces knit with purl and purl with knit). Thanks a lot for your complete answer ,but as I am a beginner,I couldn’t do it well,I am trying to knit your Climbing Frame Hat pattern,I would be very thankful If you convert it to straight needle pattern. Mama, how very sweet and generous you are, Thank-You! I love many of your patterns and appreciate that they are free. I am frustrated, however, at my inability to print instructions. I either have to write them down or I’m having to keep looking at the computer. I see that some are “printable” but most are not. Printing instructions would be a boon to your users. They are all printable. There is a printer icon at the top of each one. What does md mean, i.e. : Begin crown after a md 12 or a md 20? After a round(r n d) 12 or 20.
is their any corrections on this hat pattern as of 2-28-15? Thank you. There have been no corrections to this pattern. Some people prefer to use 4 and some 5 DPN’s. I’ve made the directions general enough to accommodate preferences. Except for the crown, this can even be made on a smaller circular needle and then moved to DPN’s for the crown. With all the m1’s and ssk and such, does the count stay the same? And if using double point needles I don’t see a way to evenly keeping to that 14 count? The count does stay the same because there is an m1 for every ssk or k2tog. I do not, but it would basically be based on a vertical stripe technique. Here is a video of the technique. I can’t get rnd 7 to work. It uses 13 stitches for the pattern and I think it should use 14? The make stitches don’t use any stitches and the ssk and the k2tog each use two stitches. So that adds to 14 stitches.